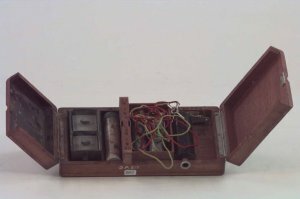 This induction coil was used to stimulate muscle tissue, in the belief that it improved health and strength. The unit was powered by an electric battery. The flow of electricity in the primary winding of the coil was interrupted by a mechanical buzzer at one end of the coil, operated magnetically. The chopped flow was transformed up to a higher voltage through a secondary of many turns of fine wire. Electrodes attached to the ends of the secondary winding were applied to the area to be stimulated, commonly from one hand to the other.